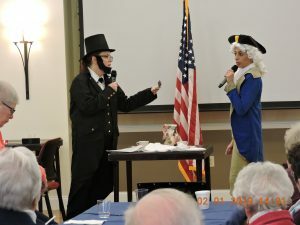 Goshen, NY – Glen Arden Retirement Community regales its audience once again with a unique and original historical reenactment. Sulekha Zaug, Director of Recreation, started this new initiative as a way to educate and entertain residents based on their interests. She writes up historically accurate scripts with the addition of, humor, flair and action. Roseanne Mytych, a Sleepy Hollow Cemetery tour guide, acts out moments in history alongside Sulekha. The first performance at Glen Arden was a re-creation of the events leading up to the Boston Tea Party. This month’s performance was a dream sequence of conversations between George Washington and Abraham Lincoln. Residents filled the room on Friday, February 1st dressed in red to support National Go Red for Women Day. Residents used the words “sensational” and “brilliant” to describe the event. They can’t wait for the next performance! Sulekha calls this series “History Alive” and considers this great programming just one of many stand out features that sets Glen Arden apart from other senior residences. Sulekha has also initiated a variety of physical and holistic wellness classes that residents have the opportunity to attend. These classes include meditation, chair yoga, Pilates, Tai Chi, as well as art therapy and special performances and lecturers. 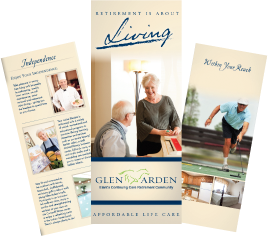 For more information about Glen Arden please visit www.glenardenny.com, or call their office at 845-360-1443.